HENRY AND JENNY NELSON are the present owners of Wylo. Henry bought Wylo in 1966 from Richard Boberg. He sailed Wylo on the Langebaan Lagoon for some years and then moved her to Simonstown. Wylo was not in a good condition. During the 70's she was laid-up on a farm in Philippi where Henry started a major renovation. HenryJenny2.jpg (40103 bytes) When Henry and Jenny moved to Hout Bay they had Wylo transported to their home, where they continued working on her. After Henry suffered a stroke the work came to a standstill. Wylo is protected with epoxy resin, plywood and glassfibre matting. It appears that she has no rot or damage to the hull. It is Henry's dream to see Wylo sail again, but he won't be able to renovate her without help. 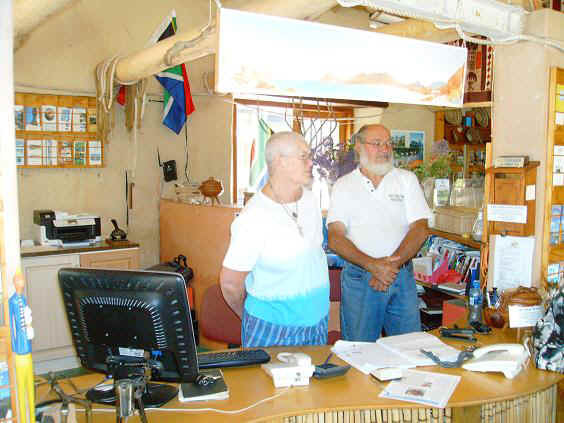 Information Centre in Hout Bay.